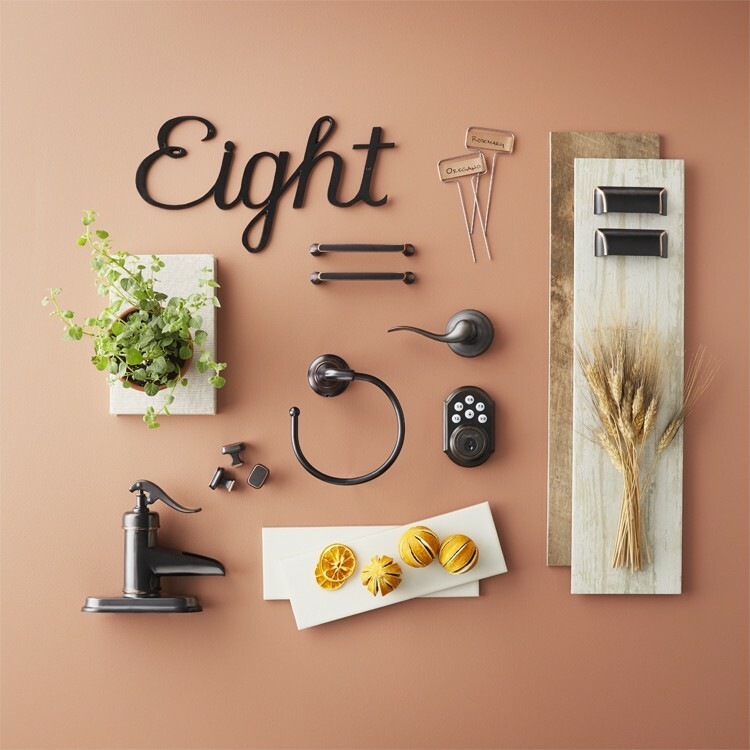 Last year, we revealed mood boards based on new interior design trends in hardware tones and finishes and how they’re combined to create specific styles—check out how we’ve styled latest interior design trends in hardware finishes, tile and paint to complete finished looks you can apply anywhere in your home. The knobs, handles, drawer pulls in a room–often an overlooked and last touch in a renovation—pull the entire look of a room together. And, replacing your hardware easily freshens up the look of your kitchen, bathroom, bedroom. It can even boost your curb appeal! Read on to find paint colors, tile selections and even house numbers, too, for these new interior design trends and how to apply these design tips throughout your home, inside or out. We mixed the warm undertones of champagne with the cool tones of antique brass and brushed nickel to create soft and organic vibes. These metals are balanced with earthy decor pieces and a muted color pallet so that one metal doesn’t dominate the other. The soft forms and shapes of the hardware stay consistent with angles, edges and lines, which is accentuated by the floral patterns in the linen. Consider adding organic decor and accent pieces, and splashes of color with fresh greenery to tie this look together. Champagne bronze—a new take on traditional bronze fixtures—seen in Delta’s Dryden collection can be used throughout many different decor styles, including modern. Re-do your whole room with champagne bronze hardware for an elegant look. Or, simply add in some of the warmth of champagne bronze to update and balance cooler polished nickel or matte black hardware. Pair it with organic-shaped tile, like MSI’s marble mosaic, and natural wood flooring for a fresh take on a traditional look. Cool, crystal-clear Lucite is currently topping our designers hot list. This interior design trend has taken interior design by storm, especially in furniture. Lucite’s light reflective surface can add glam to any room. 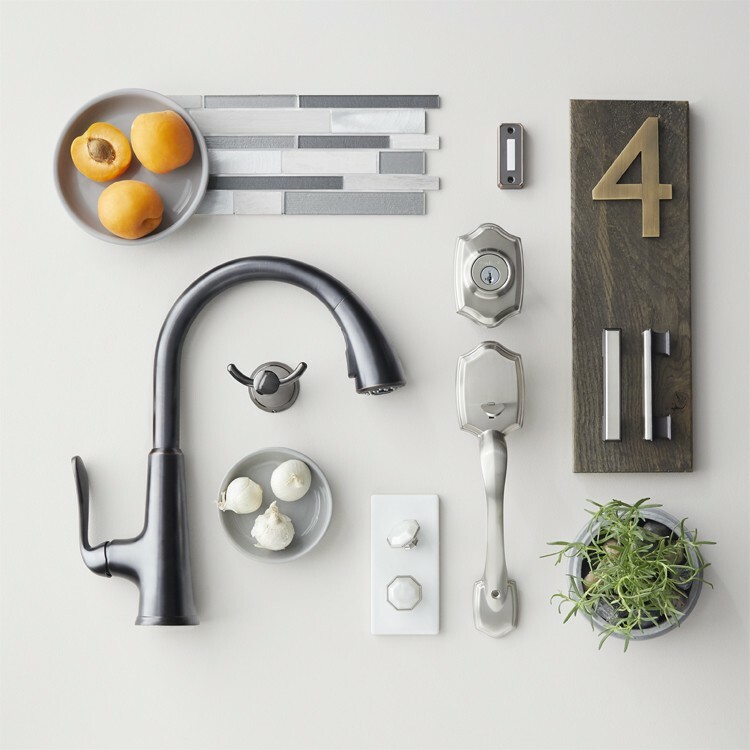 Add a little bit of depth to the room with hints of metal in your finishes, like a stainless steel faucet, and the playful shapes of mermaid tiles. A hot interior design trend in 2017 was mixing metals. This year, we’ve gone even further and mixed materials, too. Try adding in different wood tones, mixed tiles, mixed metals and greenery for an eclectic look. Everything goes together now. While we suggested following a couple of simple rules last year, eclectic, mix-and-match and breaking the rules are the new norm. Make up your own unique style by following your own rules, but try to keep it balanced and intentional. All white farmhouse kitchens are a thing of the past, replaced by rich and wooden tones. This look takes the best of rustic with antique white subway tile, adds a touch of industrial with aged Venetian bronze hardware while incorporating the sleek elegance of modern through Behr’s Mars Red paint. The shapes and lines of the knobs and drawer pulls are all fairly simple, which helps keep the look understated and approachable. This also leaves some decorative space for a few accents that have an organic, natural texture or feel. All white everything is out. Rich and vibrant hues are in, especially when paired with bold prints. 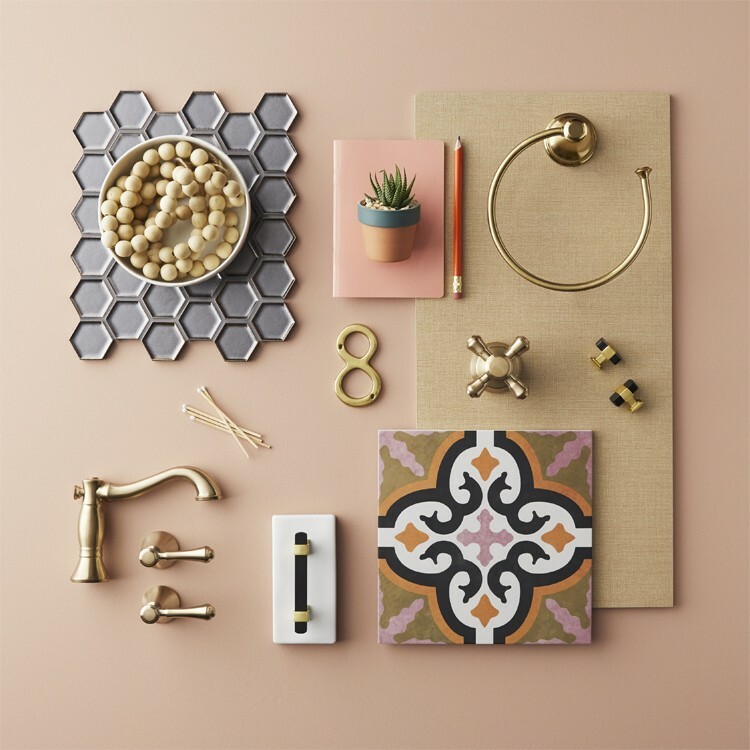 Inject pops of bold color and prints into decorative elements like tile, paint and tie the look together with sophisticated champagne bronze hardware and fixtures. Last year, matte black was all the rage—and honestly, not much has changed. There’s no wonder why, either. Not only is it the most popular finish for outdoors, it’s made its way inside, and can easily pair with almost any other finish. 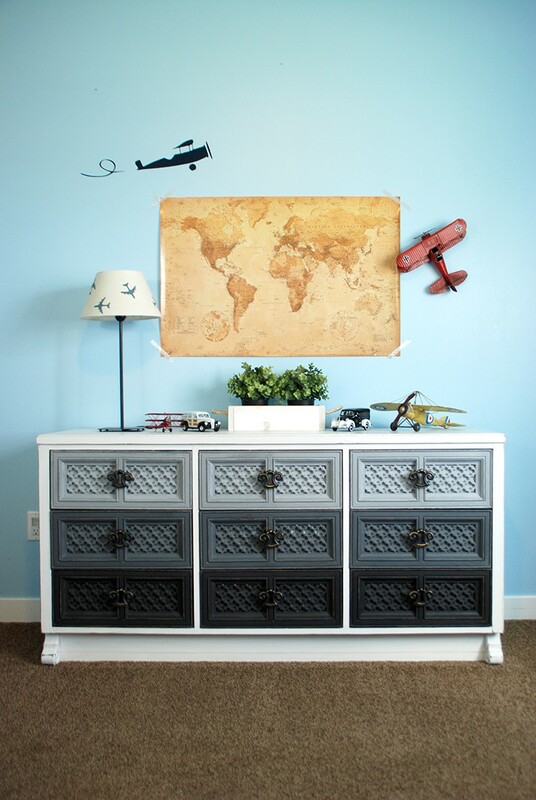 It’s super versatile and works with so many decor styles, ranging from modern to coastal. Here, the beach board wood flooring, botanical Merola and vintage-style fretwork tiles blend a modern yet fresh and industrial look without overwhelming the senses. 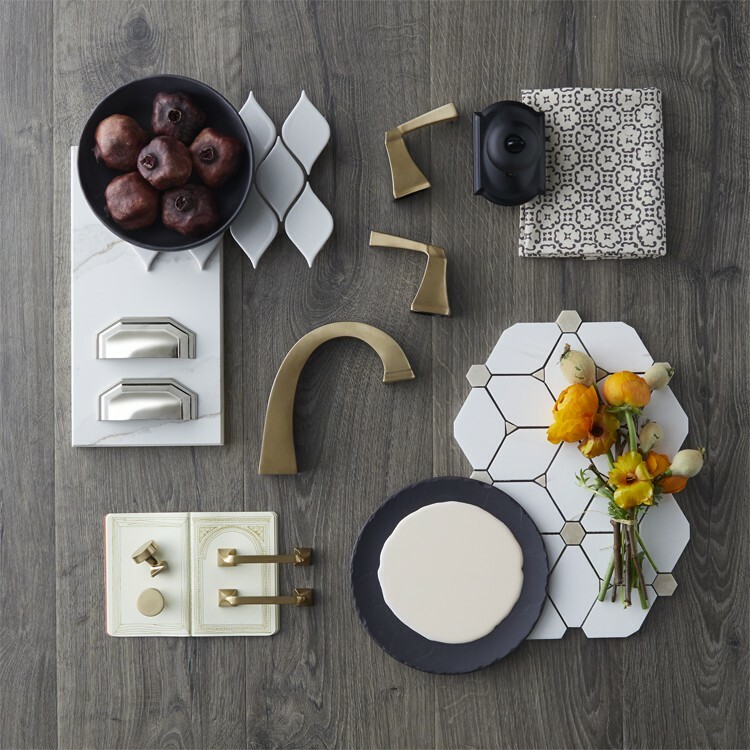 Incorporate and mix warm and subtle gold finishes like champagne bronze, brushed gold and brass for an elevated look. 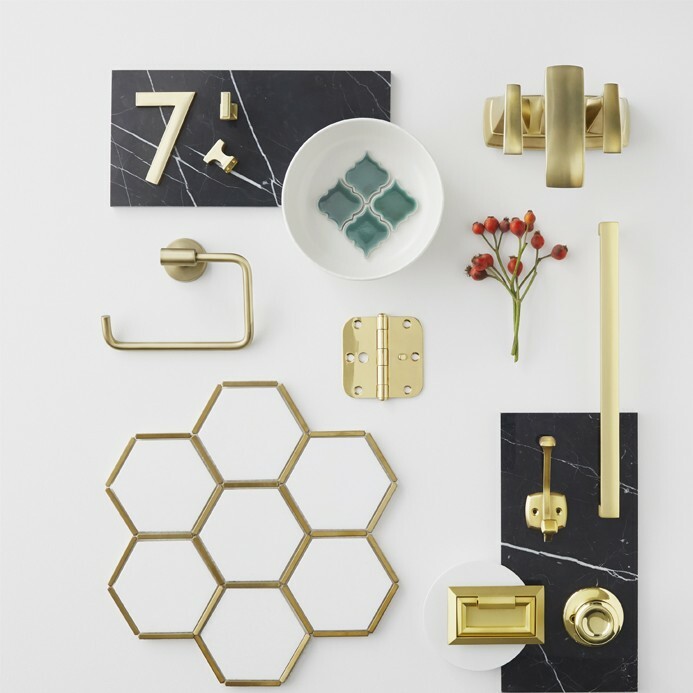 Then, for retro-inspired glam, add in dramatic black marble to accentuate golden tones. Here, we’ve paired gold hues with Tangier green mosaic tile to saturate the senses and layered in white to evoke a clean inviting look that’s both airy and luxurious. 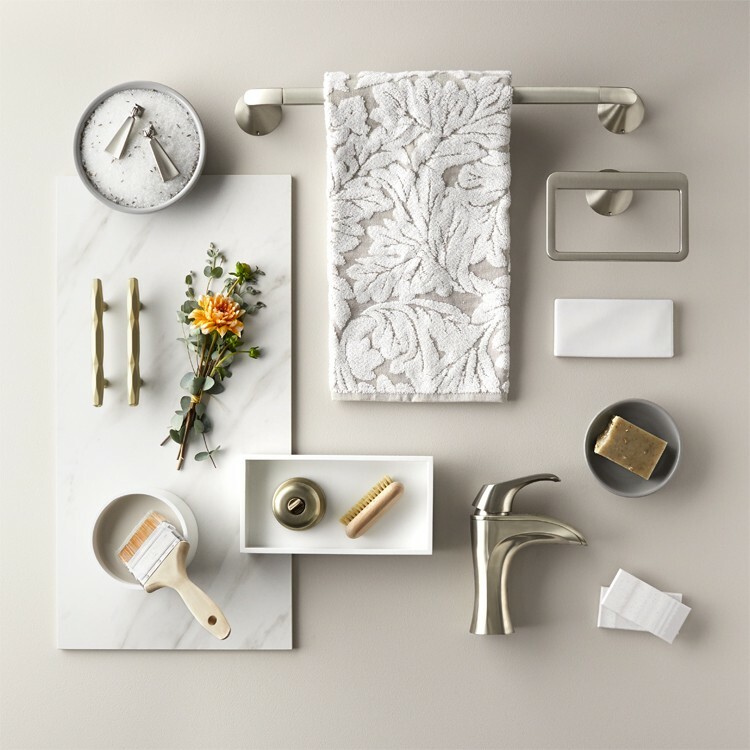 Browse The Home Depot’s Hardware Section for the latest interior design trends in knobs, cabinet and drawer pulls, handle sets, faucets, paint, flooring and more. 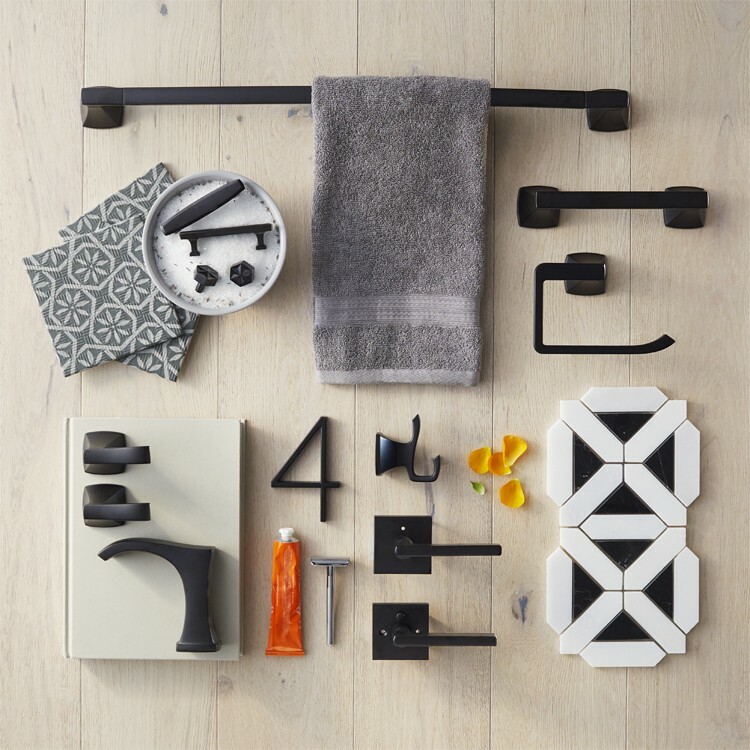 Follow our Bathroom Design Ideas board on Pinterest for hardware looks for your bathroom. 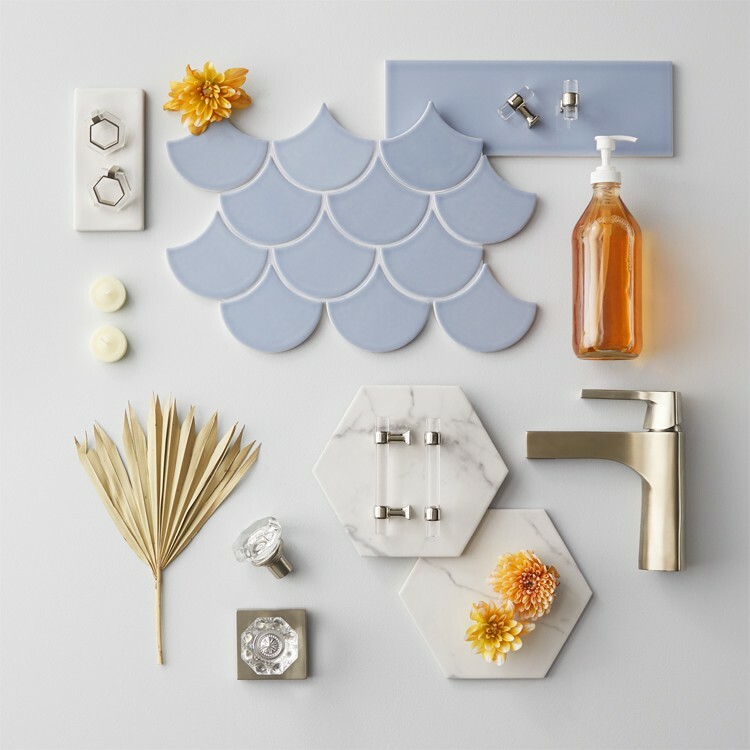 The post Latest Interior Design Trends: 8 Inspiring Mood Boards appeared first on The Home Depot Blog.